Hello...just found this brand online...has anyone tried this and opinions please.. I talked to them briefly at Della Natura. Della Natura Commodities provides ingredients. Ingredients are all grown in South America. Pet food is made in South America. Soriano Uruguay. On Whole Dog Journal 2008 approved: Della Natura Commodities ~ Bayside, NY • Wenaewe made in Uruguay by Erro S.A.
98% certified organic - the 2% is vitamins, which they say cannot be certified organic. No Chinese origin ingredients. They have 2 canned cat foods which have not yet been put on website (or have by now )... Beef , Beef & Liver. Update: Well, this is not very well received. 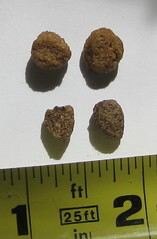 About 1/2 the size of the BG chicken kibble. With some fines from the Halo LuvALittle freeze dried chicken dusted over it they will eat it, if there's nothing else. Otherwise, they'll go drink water instead of eating it. The company has not yet responded to two requests for the nutritional profile on it either. One request via telephone; one request via email. **this is for the Dry Cat Kibbles...was there more you were requesting from them?? I'm sorry for dragging up this ancient thread, but does any one know where I can get this food? My supplier is out! merrihart, were you ever able to find a place that carries this cat food? I was trying to find it out on internet land and for some reason I cant seem to find any cat food by this brand. I was checking it out as another possible new thing to try on Ms Picky but I cant find anywhere on-line where its sold. Sandi I think they stopped making it Even the Wenaewe web site doesn't list it anymore and I got no response to my email inquiries. A shame, it was an excellent dry food, Bella did fine on it for a year. Then I brought home some canned food and she refused to touch it! Bucky had just come home and I was trying everything to make sure he could eat.